Alfred Guillou (1844–1926), Adieu! (1892), oil on canvas, 170 × 245 cm, Musée des beaux-arts de Quimper / Kemper, mirdi an Arzoù-Kaer, Quimper, Brittany, France. Wikimedia Commons. Wherever people go near bodies of water, some become submerged in that water, and drown. For those living and working on the coast, this is most likely to be the death of those who go to sea, the fishermen. 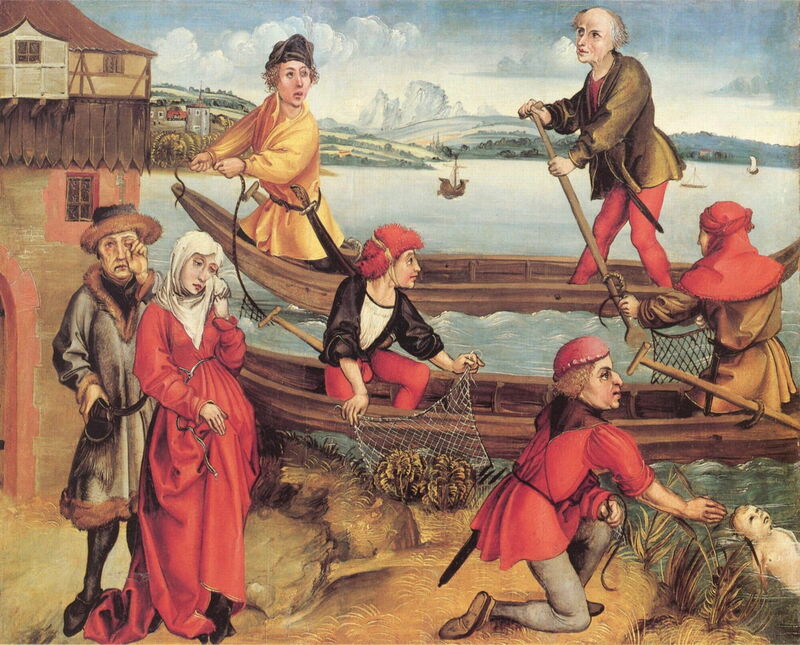 Drowned fishermen are quite a common theme in visual art, and stories of drownings have extended to other arts, most memorably perhaps in Shakespeare’s death of Ophelia in Hamlet. In this and the next article in my series on paintings of the coast, I look at drowning; although I focus on drowning in the sea, allow me the latitude to include some cases in estuaries and fresh water. Albrecht Dürer (1471–1528), Miraculous Rescue of a Drowned Boy from Bregenz (c 1490-93), oil on spruce wood, 42 x 50 cm, Private collection. Wikimedia Commons. The earliest depictions of drowning usually refer to the martyrdom of saints, but, as so often is the case, Dürer was one of the first artists to draw attention to the many children who drown, in his Miraculous Rescue of a Drowned Boy from Bregenz (c 1490-93). The boy, whose body is at the bottom right corner, doesn’t look in particularly good shape, and his parents appear to be grieving over his loss, rather than rejoicing at any miracle. The greatest legendary drowning is that of Hero’s lover Leander, who had been swimming regularly across the treacherous waters of the Hellespont (the modern Dardanelles) to visit her. Relying on her shining a light towards which he swam, one dark and stormy night the light was extinguished, and so was he. 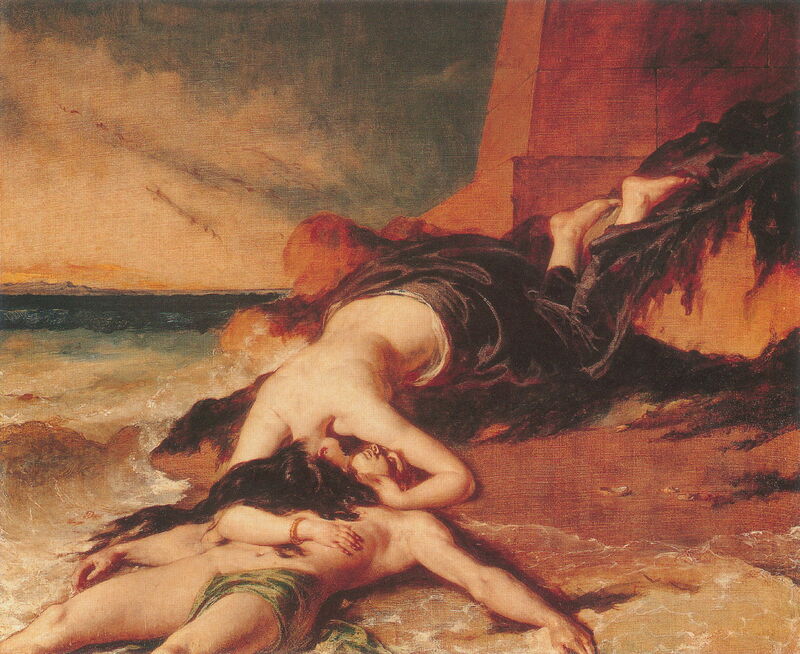 William Etty’s Hero, Having Thrown herself from the Tower at the Sight of Leander Drowned, Dies on his Body (1829) shows Hero, who has supposedly just thrown herself from a tower, embracing Leander’s drowned corpse as she joins him in death. For sheer body count, few can beat Géricault’s masterwork, the vast canvas of The Raft of the Medusa (1818-19). Semi-fictionally recreating a notorious shipwreck, this is one of the major paintings of the nineteenth century, and I have examined its making and story in detail here. Jozef Israëls (1824–1911), Fishermen Carrying a Drowned Man (1861), oil on canvas, 129 x 244 cm, The National Gallery (Presented by Mrs Alexander Young at her husband’s wish, 1910), London. Courtesy of and © The National Gallery, London. By the latter half of the nineteenth century, social realists were exploring the life of fishing communities, and the death of their fishermen. 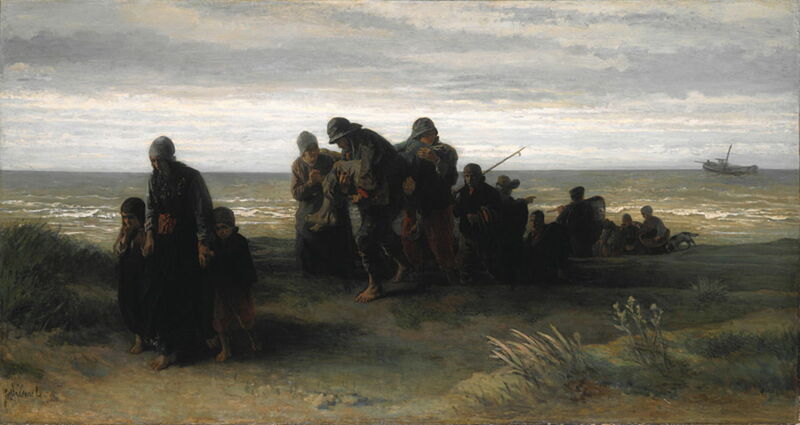 Jozef Israëls is thought to have painted Fishermen Carrying a Drowned Man (1861) from sketches made on the Dutch coast at Zandvoort. As his colleagues carry the body of a drowned fisherman up from the sea to the town, his widow and children walk solemnly ahead. A lone boat remains at sea, probably the one which had recovered his body from the water. Robert Wilhelm Ekman (1808–1873), Lemminkäinen’s Mother Gathering her Son’s Body from Tuonela’s River (1862), oil on canvas, 78 x 60 cm, National Museum of Finland. Wikimedia Commons. Another body of myth which includes death by drowning is the Finnish Kalevala. Robert Ekman’s painting of Lemminkäinen’s Mother Gathering her Son’s Body from Tuonela’s River (1862) is drawn from its Songs 14-15. Lemminkäinen is assigned three tasks in order to win the hand of the Maiden of Pohjola in marriage. He completes the first two, but the third takes him to the River of Tuonela, where he is killed, his body dismembered, and cast into the river’s rapids. 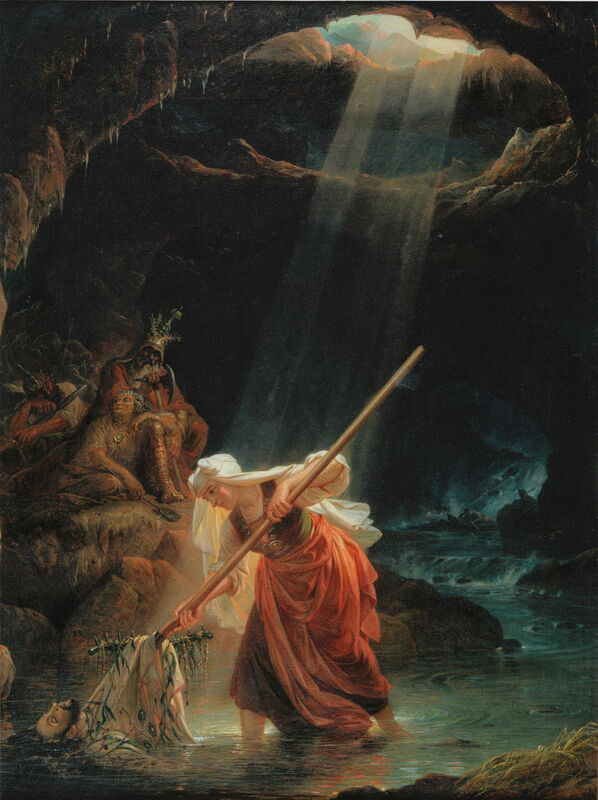 His mother finds out that he is dead, so she takes a rake to the rapids, where she recovers her son’s body parts (shown here), joins them together, and uses charms and ointments to resuscitate him. Perhaps that was a bit more than simple drowning, but it is a marvellous narrative painting. Nikolai Dmitriev-Orenburgsky (1837–1898), Drowned in the Village (1868), oil on canvas, 75 x 107.5 cm, State Russian Museum Государственный Русский музей, Saint Petersburg, Russia. Wikimedia Commons. Nikolai Dmitriev-Orenburgsky returns to the theme of children dying in fresh water in his Drowned in the Village (1868). The body of a boy has just been recovered by the man standing with bare legs, from the river or ditch at the left. Remarkably, there is not one woman present. If the Kalevala seems a little gruesome, Central European and Russian folklore is no different. The Polish painter Jacek Malczewski’s Rusałki Cycle tells stories about the rusalka, water nymphs. 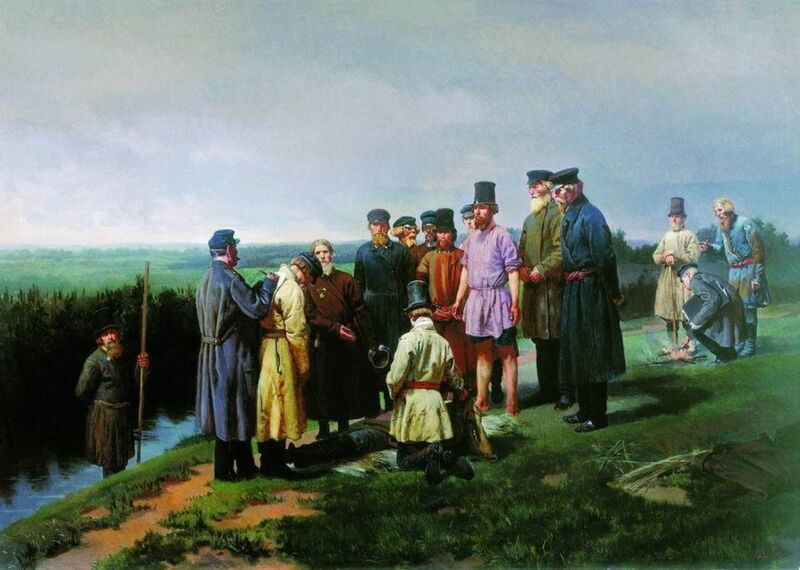 In Załaskotany (1888), I think that this shows a whole group of rusalki laughing at the way that they tricked the boy (centre foreground), who appears to have drowned as a result of their malicious prank. JMW Turner painted some moving scenes of shipwreck, and the deliberate abandonment of slaves into the water, but it was later in the century that artists got close in to examine the human consequences. Alfred Guillou’s Adieu! 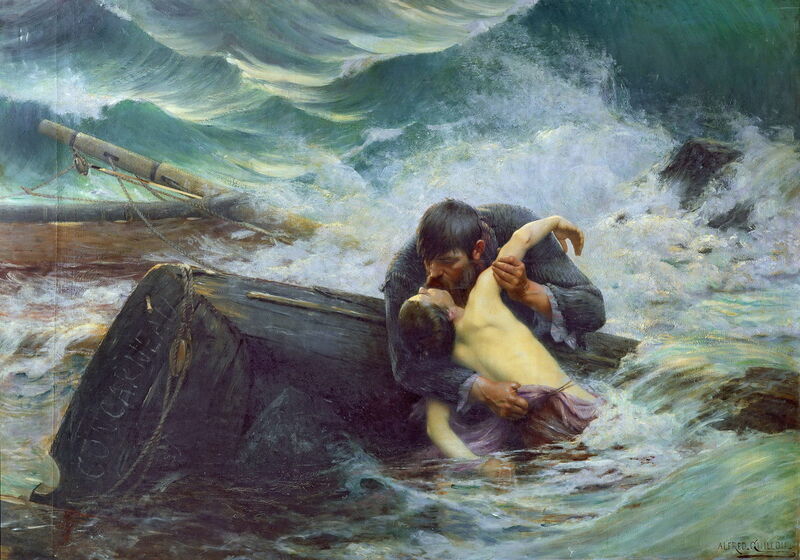 (1892) shows a survivor from a shipwreck embracing a boy, probably his son, who was not so fortunate. The name across the stern of the ship’s boat, Concarneau, places the scene on the wild coast of Brittany. 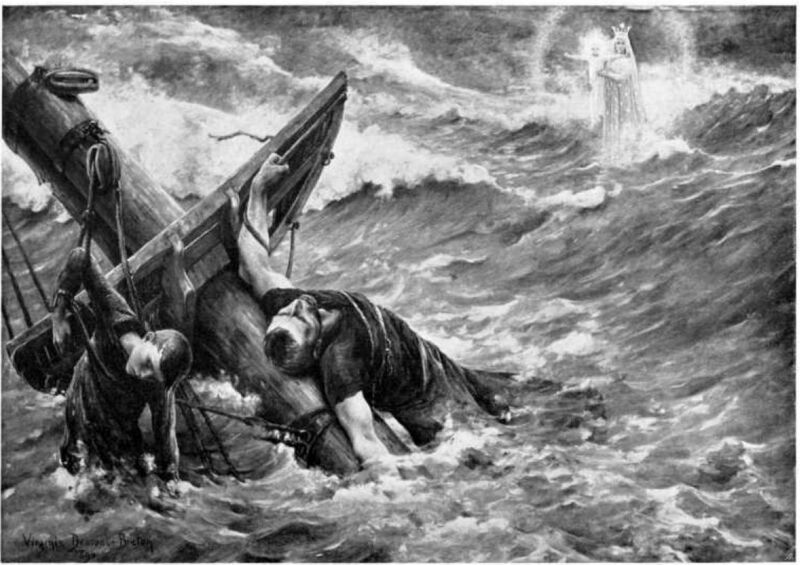 Drowning at sea is a peril recognised throughout recorded human history. In the apocalyptic visions described in the book of Revelation in the New Testament, it is told that the sea will give up its dead for the Last Judgement. 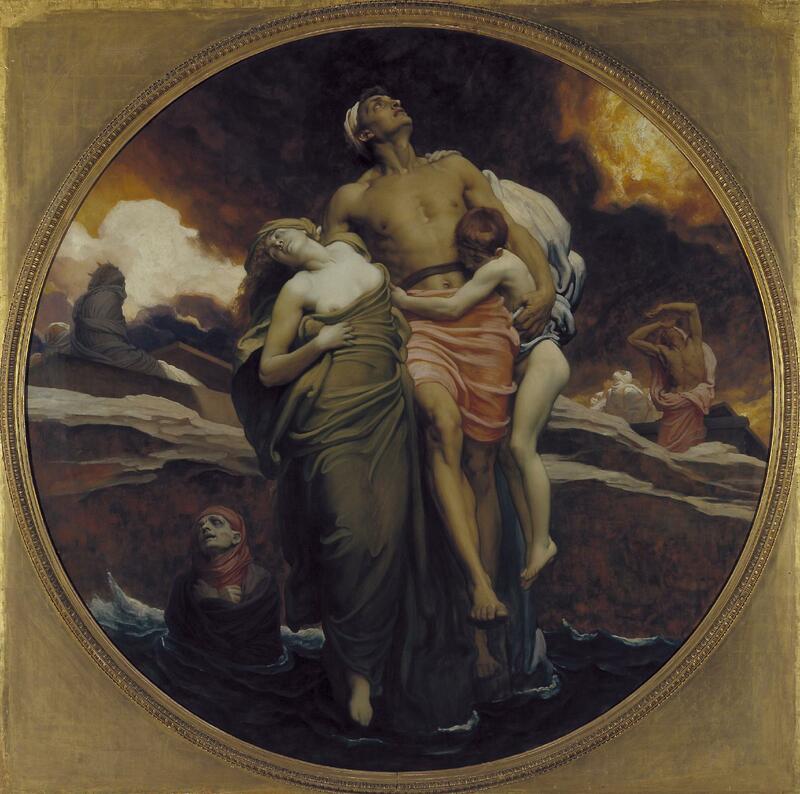 This was the basis of Frederic, Lord Leighton’s dramatic painting And the Sea Gave Up the Dead Which Were in It (1892). It is perhaps the only optimistic depiction of the drowned, but also a comment on the dreadful loss of life which had occurred as travel by sea, and maritime trade, grew so strongly during the nineteenth century. Virginie Demont-Breton (1859–1935), Stella Maris (1894), oil on canvas, dimensions not known, Private collection. Wikimedia Commons. Virginie Demont-Breton’s moving Stella Maris (1894) (seen here in a monochrome photo) has multiple interpretations. Stella Maris is a popular name for Polaris, the Pole Star, used since ancient times for celestial navigation, but is also a traditional synonym for the Virgin Mary, shown here as a distant vision, and bearing the infant Jesus in her arms. 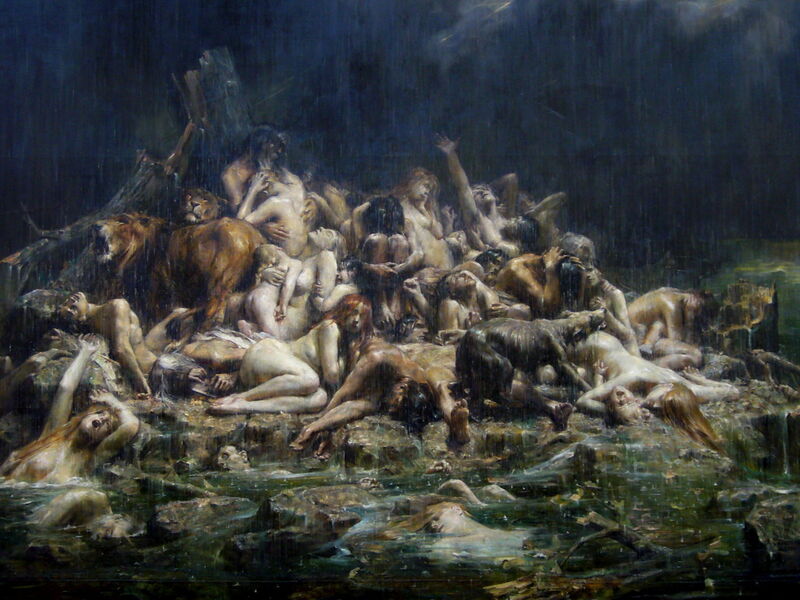 Few paintings of the Biblical Flood place as much emphasis on wetness and drowning as Comerre’s The Flood of Noah and his Companions (1911). 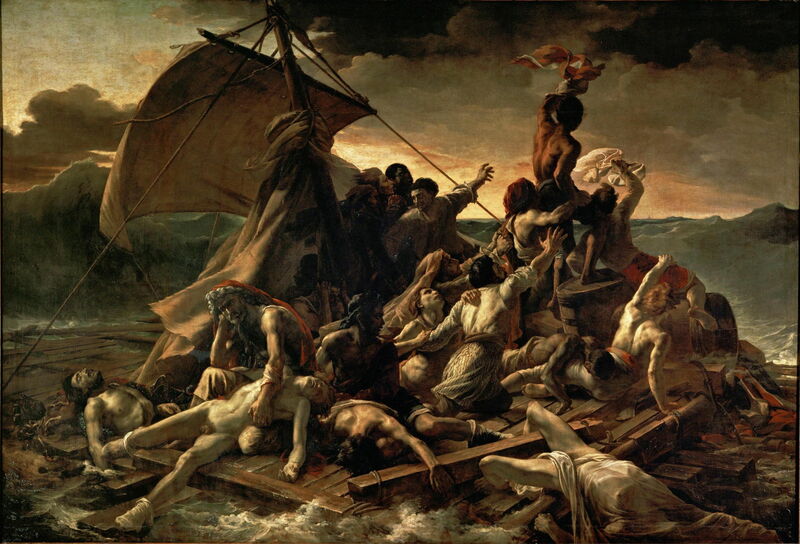 Like Leighton’s painting above, this makes reference to Géricault’s The Raft of the Medusa. My final paintings come from the artists’ colony of Skagen in Denmark, a remote fishing community only too familiar with drowning. Michael Peter Ancher (1849–1927), The Drowned Fisherman (1896), oil on canvas, 212.5 x 289 cm, Skagens Museum, Skagen, Denmark; on loan from Statens Museum for Kunst, København, Denmark. Image by Villy Fink Isaksen, via Wikimedia Commons. 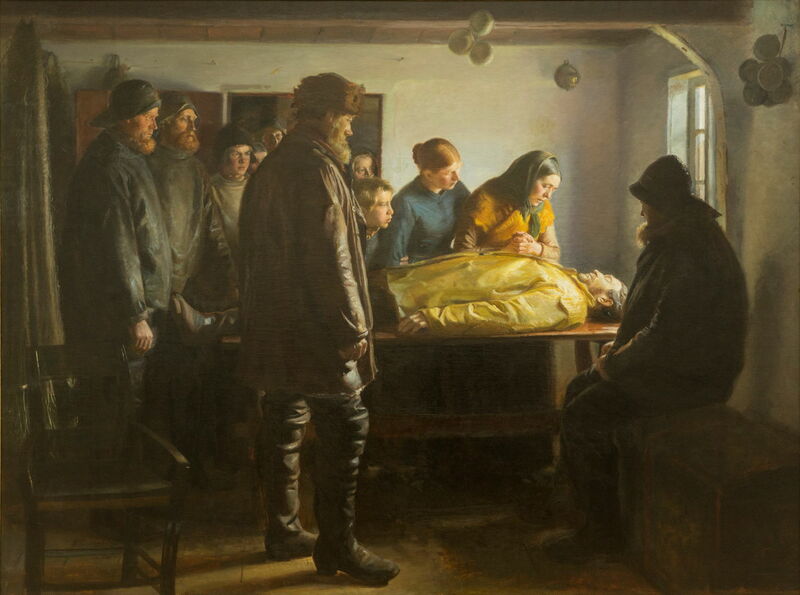 Michael Ancher’s The Drowned Fisherman (1896) is one of many paintings which he made of fishermen during his career, but his last major figurative work of them. It was inspired by the stories of two drowned fishermen, one of whom was famous for his heroism. Ancher skilfully arranges the men and women who would have surrounded a body so that the viewer becomes part of that circle. The figures, and body, are lit from a small window at the right, which enhances the tragic atmosphere. The body lies across the width of the painting, still clad in wet oilskins. Together with the clothing of the grieving wife and daughter, those are the only bright colour. Thorvald Niss (1842–1905), The Drowned Man’s Ghost Tries to Claim a New Victim for the Sea (date not known), media not known, 28 x 44.5 cm, Skagens Museum, Skagen, Denmark. Wikimedia Commons. 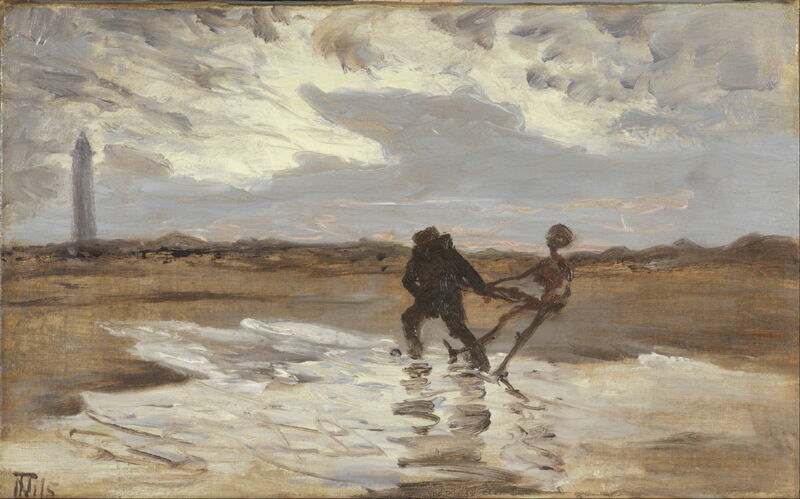 In Thorvald Niss’s undated The Drowned Man’s Ghost Tries to Claim a New Victim for the Sea, the ghost of a fisherman who died by drowning appears to a living fisherman, and tries to drag him to the sea, so that he can join him by dying in the water. This was a common theme among folk tales and legends in fishing communities. 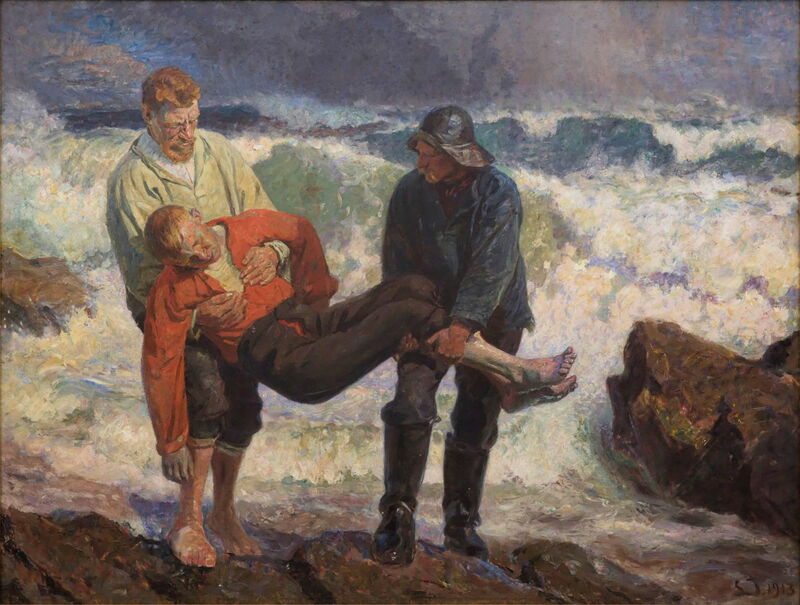 Laurits Tuxen (1853–1927), The Drowned is Brought Ashore (1913), oil on canvas, 178 x 233 cm, Skagens Museum, Skagen, Denmark. Image by Villy Fink Isaksen, via Wikimedia Commons. Finally, this is Laurits Tuxen’s The Drowned Man is Brought Ashore from 1913, completed between the loss of the Titanic in 1912, and the start the First World War, with its huge toll of drowned men, women, and children. Having focussed here on drowned men, the sequel will look at drowned women. Posted in General, Life, Painting and tagged Ancher, coast, Comerre, Dürer, Demont-Breton, Dmitriev-Orenburgsky, Ekman, Etty, Géricault, Guillou, Israels, Leighton, Malczewski, Niss, painting, Tuxen. Bookmark the permalink.